Happy family having great time together in the nature. Mom teaches her daughter to cook marshmallows on open fire. 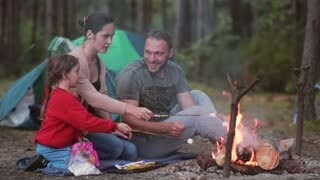 Family rest in the nature with their little son and daughter, they cook marshmallows on open fire and eat them. A woman hangs a cauldron on an open fire in a Viking camp.